A series of photographs and digital photo-collages about individual mapping and knowledge of a city. 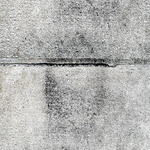 The imagery is of markings on the streets, walls and sidewalks of Manhattan. Occasionally there are images from other places, details of my own paintings or scans of antique postcards. "Notes about a Walk #2"
"A Corner in the City"
"Found Portrait in a Hat"